The CM-18 & CM-20 are cube conference microphones. It is small and easy to carry, but yet can pick up clear audio from 10 feet away. It has a 3.5 mm mono straight plug. 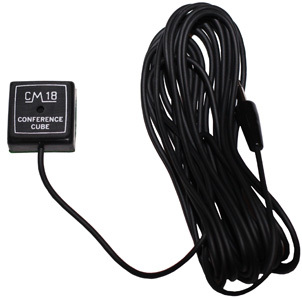 The CM-18 and CM-20 are identical with the exception that the CM-18 has a 3.5mm jack whereas the CM-20 has a 2.5mm jack (CM-18 shown below).